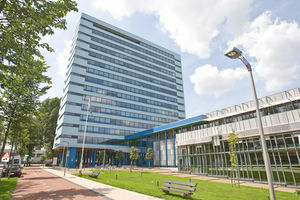 TU Delft is one of the few universities in the world with its own aircraft for applied research and education. The Cessna Citation II PH-LAB was originally built as a corporate aircraft, but now functions as a versatile flying laboratory and classroom. A total of eleven high-speed and low-speed wind tunnels are used to demonstrate aerodynamic theory. Experiments can be performed in speeds that range from the subsonic at 35m/sec to the hypersonic at Mach 11. A good structure is fundamental to the success of a new aircraft or space craft design. The materials and joining techniques need to meet high standards; it’s essential that the structure is safe, light and sustainable. The Aerospace Structures and Materials Laboratory combines a pioneering spirit with extensive knowledge and expertise in the fields of smart materials, structural design and production techniques. The goal of the Micro Aerial Vehicle Lab is researching small flying systems. Micro Aerial Vehicles (MAVs) are aircrafts with a span of not more than 1 m and a start weight of less than a kilogram. Students and researchers use the Cleanroom to build and test hardware for spacecraft, such as satellites. The Cleanroom is an immaculately clean laboratory, in which work is conducted as meticulously as possible so that the risk of particle contamination is minimised. In the human-machine laboratory, there is a fix-based simulator that is able to simulate both aircraft and cars. The small but versatile laboratory is used for experiments involving control functions and research into visual perception. The Faculty hangar houses a collection of aircraft and spacecraft parts such as cockpits, wings, advanced sensors and rocket parts. It also has a helicopter, a Starfighter, and a test model of Europe’s largest satellite, ENVISAT. Students use the collection for a greater understanding of the design and performance objects with a view to generating new ideas and solutions. The calibration laboratory is located on the ground floor of the faculty of aerospace engineering, next to the flight laboratory. The calibration laboratory is mainly used to calibrate inertia sensors used in the cessna citation laboratory aircraft and the SIMONA simulator. By contacting also others can use these equipment. A research and testing lab for flying and ground based swarm robots. The robots are designed to work together autonomously in any environment performing a task without the help of humans. The lab is for scientific research as well as a safe environment where the robots are tested with the help of a motion capture system.